What is TECNOCOAT 100% pure polyurea? 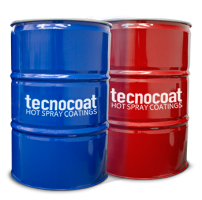 TECNOCOAT products are a range of high quality waterproof membranes produced by subjecting their liquid component to high temperatures and pressure. Their excellent mechanical properties have made them one of the most widely used membranes for construction work involving demanding technical specifications. TECNOCOAT is a range of products designed for waterproofing and protection in general. 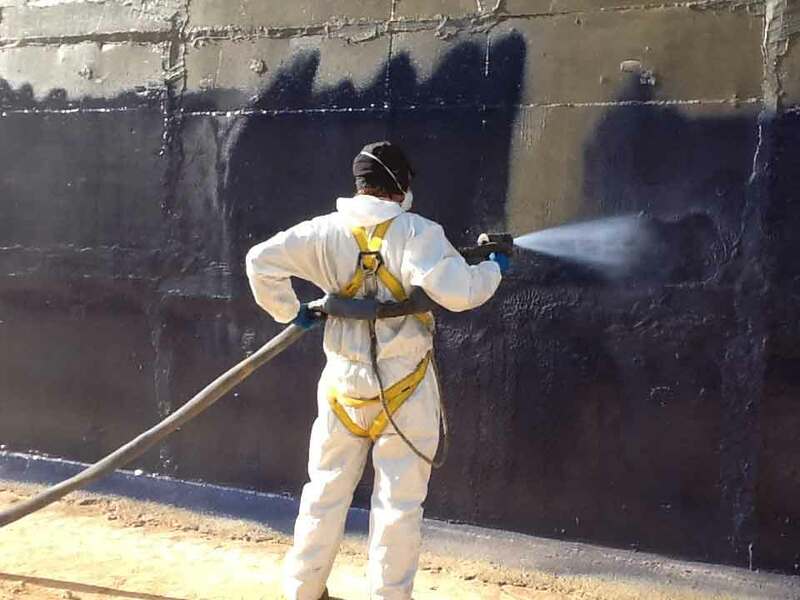 Within the TECNOCOAT line we would highlight TECNOCOAT P-2049, a projectable bi-component pure polyurea which forms a 100% solid and waterproof membrane, with no joins or overlaps, completely adherent to the surface, environmentally sound and with the additional advantage of drying in just 5 seconds. Thanks to its high level of adherence to the majority of surfaces, TECNOCOAT products provide a secure and permanent union with the surface, ensuring a rust and corrosion free finish which can be made anti-slip and is available in any colour. TECNOCOAT coverings are extremely durable, resistant to chemical products and provide excellent and lasting results in all weather conditions. TECNOCOAT P-2049 is applicable for a long list of surfaces, the most common applications and therefore more recommended are, polyurethane foam, fiberglass, wood, ceramic, metal, concrete etc. Elastómero de poliurea pura aromática bicomponente que una vez aplicado proporciona un recubrimiento impermeabilizante sin juntas, continuo y completamente adherido al soporte; de alta resistencia al desgaste y a la abrasión, así como al contacto con productos químicos. Con un secado al tacto de tan sólo 4 segundos, puede ser transitable por tráfico rodado en un período inferior a las 3 horas. La membrana TECNOCOAT P-2049 posee certificación ETE 11/0357 con una vida útil de 25 años para un grosor mínimo de 1,4 mm. but... what its pure polyurea? 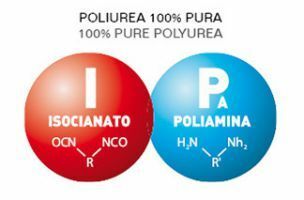 In terms of molecular structure, a PURE POLYUREA membrane is obtained by mixing two reactive components: an isocyanate group and amines. The reaction of the amines with the isocyanate group results in the formation of a urea linkage. 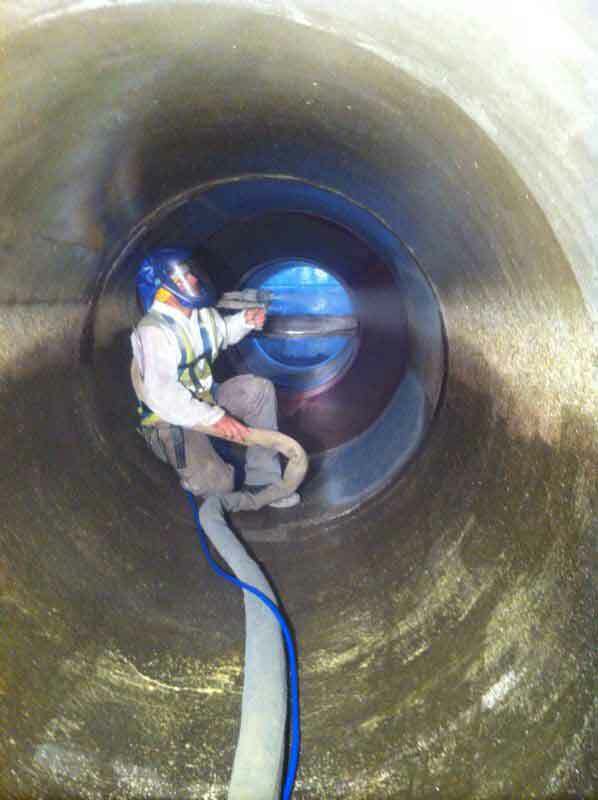 Polyurea membranes can be formulated as hybrids by combining the two components above with a mixture of polyols. If only polyol linkages are present the result of the reaction is polyurethane. TECNOCOAT P-2049 is applicable for a long list of surfaces, the most common applications and therefore more recommended are, polyurethane foam, fiberglass, wood, ceramic, metal, concrete etc..
As a coating to separate internal and external agents very useful for tubes carrying water, chemicals, seweage, gas, etc. 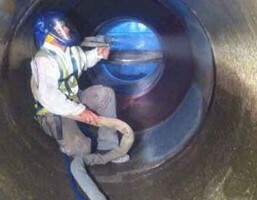 For waterproofing in the construction of swimming pools, reservoirs or deposits. Indicated especially for the effective waterproofing of gardens, landscape coverings (VYDRO) and other outdoor constructions. For transited surfaces that need to be waterproofed like flat or sloped roofs or patios. Also very indicated as anticorrosive treatment the case of metal, such as the protection of a low layer of polyurethane foam that is outdoors or for encapsulating fiber cement siding. In transited public areas such as commercial facilities, parking lots and industrial warehouses with a need for paving that is very resistant, waterproof and simultaneously antistatic. To avoid leaks in containers that contain chemicals or corrosives, preventing leaks that damage the environment or harm people. As a pavement coating in clean rooms or industries where complete requires a continuous pavement, bacteriologically stable and resistant to wear as well as to diverse corrosive products. As an impermeable treatment for electrical boxes or closets needing antistatic properties that does not interfere with the components. Highly indicated to avoid the statics accumulation in stores of explosives, elevators, operating theaters of hospitals and places that should be free of this type of charge. In all kinds of aquatic facilities: leisure, fish farms and aquariums, providing a secure and lasting waterproofing. In the protection of interior coatings of vehicles, vans, trucks against the corrosion of climate agents. As well as the long-term maintenance for continued use. The substrate should be consistent and have a tensile strength of 20 ~ 25N/mm2 (HA-20 ~ HA-25), as our membranes have adhesion strengths of up to 1.85 N/mm2. If you are not certain of the strength you should inspect the substrate and, where possible, carry out tests to determine the tensile strength. If there is a weak layer of cement on the substrate or it has an uneven surface you should prepare it mechanically (milling, sanding, shot-blasting). If there are any cracks or small holes they should be filled in and compacted with the appropriate filling, made using our PRIMER EP-1020 product which is very hard and fast drying. Specific areas, such as structural joints and perimeter flashings with walls, should be prepared using DESMOSEAL MASILLA-PU putty and/or TECNOBAND 100 (ask our technical department). When all the preliminary work to prepare the substrate has been completed you should clean the area, clearing away any debris or loose material. The surface should be cleaned by applying our DILUYENTE TEC-4U solvent to ensure fast evaporation and drying. In the areas with overlaps, or the finishes of mechanical roof elements, we recommend using TECNOBAND 100 and/or DESMOSEAL MASILLA-PU putty to absorb the mechanical loads that are generated in this type of roof (ask our technical department). Please contact Tecnopol Sistemas´ technical department if you have any queries about other types of substrate (fiber cement, wood, asphalt, ...). You should also apply one of our primers (see table a) to increase adhesion to the substrate and achieve a correct surface finish. It can be applied by brush, roller or an airless spray. In the case of concrete surfaces, the concrete should have completed the 28-day curing process after casting. You should also check that the degree of moisture in the surface of the substrate does not exceed the maximum allowable level of the product. To check the primer has dried, touch it with your fingertips. The drying time varies between 1 to 6 hours, depending on the primer used, the ambient temperature, and the temperature of the substrate. The primer loses its properties 24 hours after it has been applied, which means that if more time has elapsed the substrate will have to be repainted. It will also have to be repainted in the event of rain. 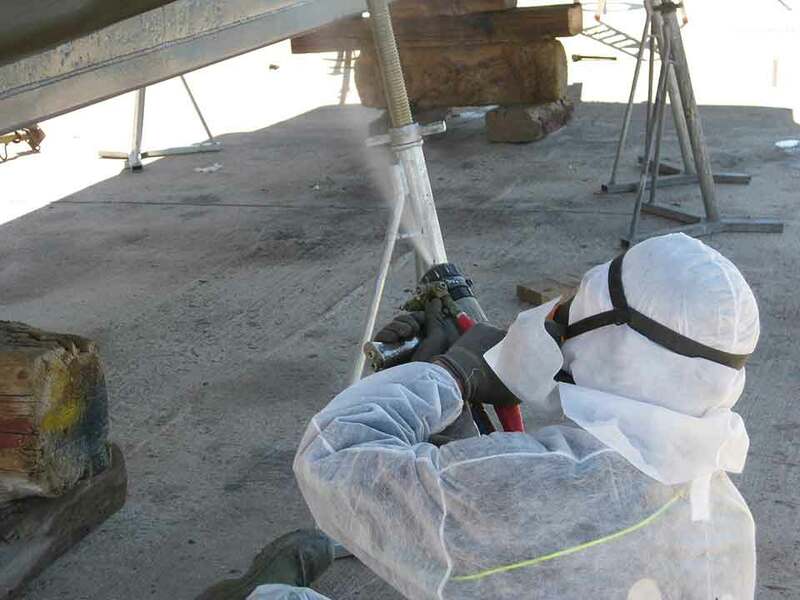 Apply TECNOCOAT P-2049 in a uniform way with a high-pressure sprayer (Reactor E-XP2), which can mix the two components at a pressure of 2.700 psi at 75ºC. * If you want to apply a second coat of TECNOCOAT P-2049 and more than 48 hours have elapsed since the first coat of TECNOCOAT P-2049 was applied, the surface should be sanded and cleaned, and a primer coat of PRIMER epw-1070 applied. What certifications has TECNOCOAT P-2049? “European Technical Approval” means a favourable technical assessment of the fitness of a product for an intended use, based on the fulfilment of the essential requirements of the construction work for which the product is to be used. TECNOCOAT has an ETA certificate. Products and systems for the protection and repair of concrete structures in compliance with European standards. The Applus certificate for TECNOCOAT P-2049 certifies that, with respect to the analysis parameters, the material complies with the requirements established by Royal Decree 140/2003. It also certifies that the product has no chemical reaction at chlorine levels of 20 ppm, and therefore complies with the parameter set in the requirements of Royal Decree 140/2003. The TECNOCOAT P-2049 membrane has a certificate issued by Applus certifying that the migration into ETHANOL is below the overall migration limit set in the UE No 10/2011 REGULATION. Consequently, TECNOCOAT P-2049 is an effective coating suitable for lining and waterproofing wine, beer, and liquor containers. 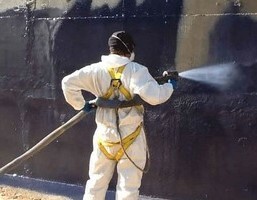 What type of product is pure polyurea Tecnocoat P-2049? A two component projectable membrane, completely impermeable and solid. Also, it protects against corrosion and wear from external agents. Where can I apply Tecnocoat P-2049? On any type of flat or inclinedsurface with a prior conditioning to the support. Since it is a projectable continuous membrane, it provides the versatility of being adaptable to any irregular surface. How should I apply Tecnocoat P-2049? Tecnocoat P-2049 is applied by means specific projection equipment, GRACO REACTOR E-XP2, with a control system for temperature and pressure for the products, which avoids possible mix errors in the composition of the components. Can I apply Tecnocoat P-2049 to paving or an existing roof? Yes, simply keep in mind the preparation of the surface, cleaning them of dust, oils or grease, or of possible voids which will need filling. The ideal application surface would be a completely continuous support and with a minimal and regular roughness. Are joints or seams needed? Tecnocoat P-2049 does not have joints since the application is direct to the support, to perimeter parapets, and to singular points as there are sewer pipes, corners or finished work. Being a completely adherent membrane, it does not create interior air bags and, therefore, it has a very high superficial resistance. It is perfectly applicable on existing joints of up to 10 mm. of width. What colors are available for Tecnocoat P-2049? It appears in a variety of colors as there is gray, dark gray, black, green and red. Although if it is preferred it is possible to apply a specific aliphatic finish with a wide scale of RAL colors. How long does Tecnocoat P-2049 take to dry? Tecnocoat P-2049, is stable and dry in seconds, it can be transited, guaranteeing the properties of the waterproofing, in an approximate period of 3 hours. What happens in case of leakage? Failure of Tecnocoat P-2049 is scarce, although in case of moisture leakage due to a mistake in the application of the waterproofing, breakage after application, or repair of some existing element, as it is a completely adherent membrane, so the origin of the water coincides with the area of the leak, the location of this point is direct and therefore, it diminishes or limits to a minimum the work necessary for repair. When can I apply Tecnocoat P-2049? The support should be at least 4ºC and above the dew point to reduce the risk of condensation. What other elements besided roofing can I waterproof or protect? Tecnocoat P-2049 can waterproof concretewalls, deposits, cisterns or swimming pools. As well as any element needing waterproofing or protection from corrosive agents. Is the application of Tecnocoat P-2049 rapid? Yes, performance is the most rapid in the market comopated to similar waterproofing membranes. It is possible to apply, in good conditions of support and climatology, up to 200 m2 of work per day. What resistance does it have? It is a product with a high adhesion resistance to the support, minimum of 15 N/mm2, a break resistance of 35 N/mm., and traction resistance of 15 N/mm2. Can I apply Tecnocoat P-2049 on another completed waterproofing that needs repair or substitution? Yes, with our system you only to clean the surface well, in some cases you may need to strip or sand, always under the supervision of an authorized product technician. Does it protect against corrosion? Yes, in cases in which corrosion protection is necessary, Tecnocoat P-2049 protects perfectly against this pathology. No, in cases where it is necessary to apply in drinking water tanks, Tecnocoat P-2049 possesses a potability certificate (APPLUS nº223-09-8849), which guarantees its effectiveness without contaminating its surroundings. What type of certifications does the Tecnocoat P-2049 waterproofing system possess? The system Tecnocoat P-2049, possesses the certificate DITEXXXXX sent by the Institute Eduardo Torroja with a useful life of 25 years. Also it has obtained the homologation in ethanol migration (APPLUS nº 2232-11-5626) and of water potability (APPLUS nº223-09-8849). What other uses or applications does Tecnocoat P-2049 have? The versatibility of Tecnocoat P-2049, is quite broad. It can be applied in impermeable coverings in deposits, cisterns, interiors of bathrooms, aquariums both for exterior decoration and pavement. Applications in swimming pools with all kinds of colors or forms. Protection of high wear pavement, offering anti slip surfaces in areas such as parking ramps, or interiors of industrial warehouses. 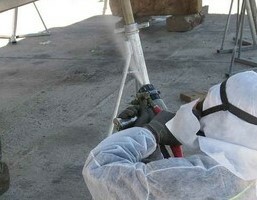 In the field of the industry, protection against corrosion is a common and indicated application. Tecnocoat P-2049 offers a high resistance against a wide range of big chemical elements in solution or concentrates. Occasionally, there are also military applications.